Truly a wonderful place, it's countless varieties of trees & plants, a lake and a hillock is a great combination. During my school days, I used to come here with my brother or friends.. oh those wonderful times we had climbing trees, swinging from aerial roots, picking Singapore cherries, floating paper boats in the lake, run up & down the slopes of rocky hillock, and what not. There's an open-air badminton court near the horticulture nursery. A friend and I used to come there early mornings for a walk and a game of badminton. Sometimes we would simply sit on the rock enjoying the cool air and the warm touch of early morning sun rays. 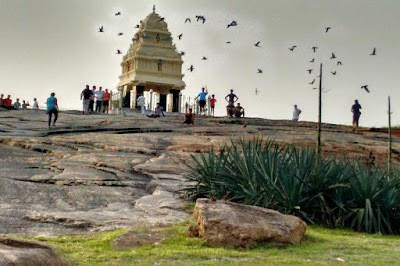 Lalbagh's rock is a favourite sit-spot for many regular visitors. Even maize and peanut vendors hand around Kempegowda's Mantapa. A decade ago, the Mantapa was not fenced, visitors could sit inside the historic monument. 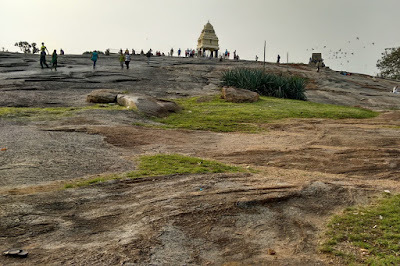 Stone was quarried from this spot long time back for sure, probably during Kempegowda's and Tipu's days. 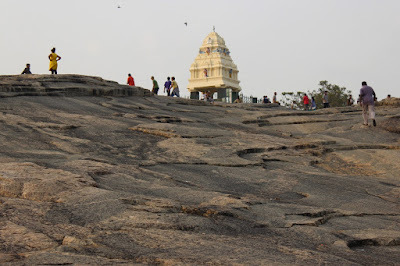 Probably quarrying ceased after Kempegowda installing his Mantapa here. Now, people love this rock rock no one dare touch it. During a recent visit, I happened to notice a plaque which declared this rock formation as a national geological monument. 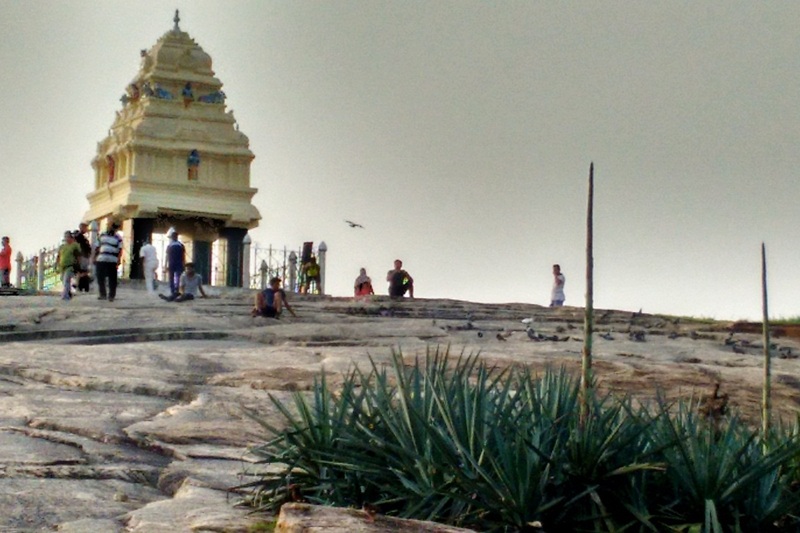 Wow, Lalbagh never ceases to surprise. 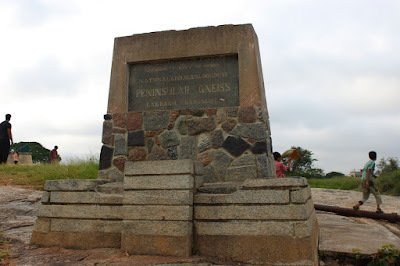 This monument is over a typical exposure of Peninsular Gneiss, a geological term for complex mixture of granite rocks extensively developed in peninsular India. 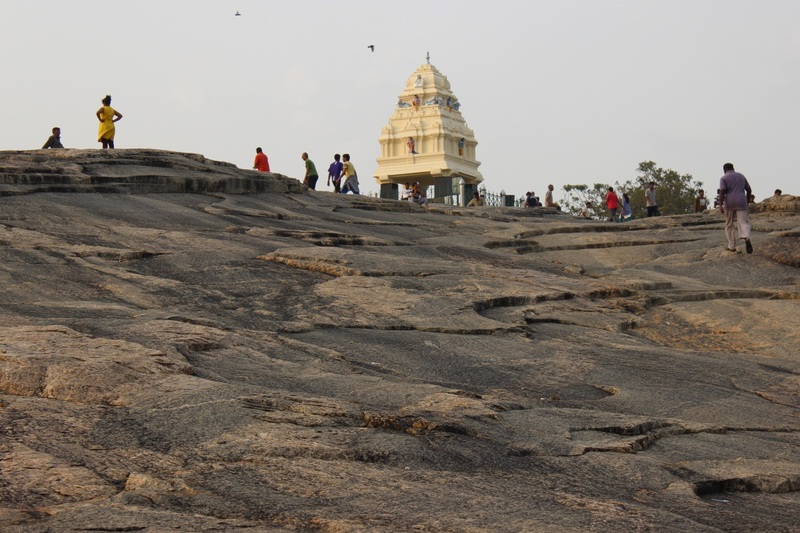 The term was coined by Dr. W F Smeeth of Mysore Geological Department in 1969. The Peninsular Gneiss is among the oldest of rocks of the Earth dating back to 3000 million years. The antiquity of these rocks has attracted geologists all over the world and has given rise to erudite scientific papers on the evolution of the Earth by the pioneers of the Mysore Geological Department, Geological Survey of India and scholars from the academy. Stone quarry of this Gneiss still continues to be an endless source of material for research in the various branches of Earth science. Right opposite this rock is the Bonsai Garden.